I will more than likely take early "retirement" and sell a car or 2 to simplify my life. With this being the driving force, the stock market being on a tear, and the value of the $$ being weak, I am considering to consign the 930 to one of the auction houses for Amelia Island in March. Between RM, Hollywood, Gooding, and Bonham's, which one would best the bet fit (maximize the net cash in my pocket) for the 930? it is a 44k mile excellent car rate a 2/2- per an appraisal in 2015. Looking at the cars to be auctioned, I don't think I saw an early 3.3 turbo. Given the inventory that I've seen in the past, my vote would be for either Gooding or Bonham's - other members will likely chime in with any personal experiences. Best of luck! Have you considered Bring-A-Trailer? They seem to be pulling some good prices. 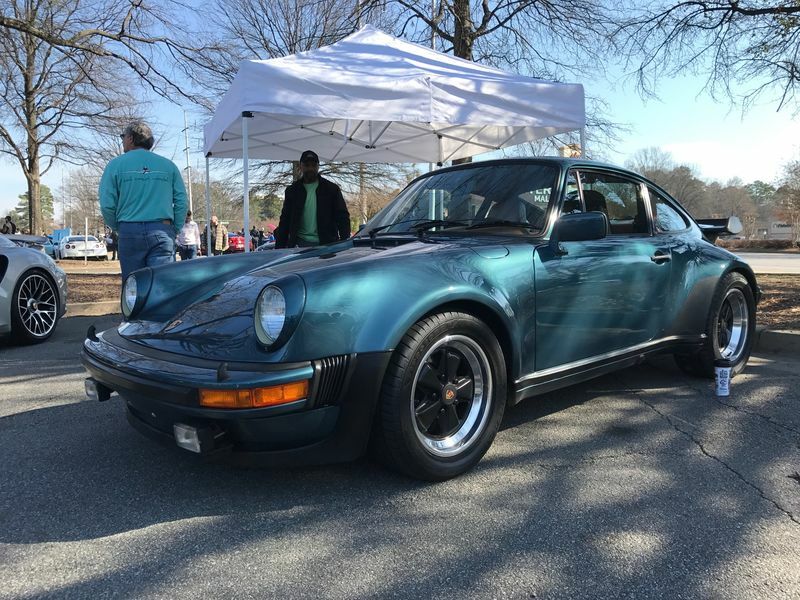 1975 911S (3.2) "The Blue Goose"
Original paint? Really a condition 2? 78/79? Gooding will bring $135,000 to $150,000 depending on crowd. That is a VERY desirable color so Im guessing closer to $150,000. BaT... not sure lately they just don’t bring the money for original collector cars. BaT is more of a enthusiast site than collector auction site. Collectors with $150,000+ to spend will want to see,touch,smell the 930 and it’s patina before they will let go of the $$$. I must say you have one very desirable early 3.3. Let me say that I feel you are selling too soon.. The market still does not recognize or even appreciate the significance/importance of these early 3.3s 78/79 930s in relation with their place in the history of the 930. In time they will I believe be right along side the 3.0 cars. Last edited by 93097004xx; 01-29-2018 at 12:49 PM..
Seinfeld used Gooding a couple years ago when he sold a pile of cars. Seinfield also took four of those cars back to New York from Amelia Island. Due to "no-sales". Your also paying a 10% premium. I've casually checked the Gooding auctions, and it seems like any car with an expected range below $300K is sold at no reserve. So you have to be comfortable with that. Not so sure I could stomach it. How many times have we seen Wayne Carini with that crestfallen look after the expected bidding war failed to materialize, after claiming (or hoping/praying) that "no reserve" would really get the action going? Of course check to make sure that's the case, but that's how the recent auctions looked. You're too late for Amelia. Think Monterey. I'll likely be sending a 70S there c/o Gooding. RM & Gooding are probably the pickiest and sell the best quality cars out of the bunch. Not sure the auction route is going to get you the most money after considering transport, prep and fees etc... It's always a gamble. There is a low mileage '77 930 on BAT now, that is worth watching. Personally I'd list car for sale on usual sites and see what happens, you have nothing to lose by running a BAT auction but they will probably want to list a lower reserve than you may be comfortable with. I'd put fellers out to the auctions companies and see what they have to say - this is not a risk free strategy as you need to get car to auction site and back home if it doesn't sell. The 930 market has lost some steam over last couple of years but beautiful original cars like yours are not just hanging out everywhere- GLWS and enjoy your retirement. I would first try to sell it on the more conventional sites (PCA, Excellence, Pelican, etc.) before engaging an auction. If you feel comfortable with the value, offer it for sale to see the reaction prior. There are many fees and other out of pocket costs that negate the benefit of an auction. Yeah you don’t want to sell your 930 or testarossa on BaT.. The was a ridiculous result. Considering the rusted out junker 911SC that just sold on BaT for $32k, your 930 should go for $500K. Agreed much too late for the houses at Amelia. Too often the overhead of placing a car in an auction house negates the best value of an average or above average car. Your objective at these auctions is to stimulate interest in non-Porsche buyers, with extreme low mileage, unique color combos, or rarity. The 930 is surely not rare in the spectrum of these auctions so you better come with a very clean, well preserved example. The Petrol blue/cork interior is a huge advantage. With prices fluctuating it’s unpredictable on the worth at a particular place in time. Are you willing to deal with the contingencies if it doesn’t sell and you find yourself $2-3k into a car you still own? It’s kinda like a hand of limit poker, the more players you have to call your nut-hand the more money you can potentially make. A unique colored cashmere ‘79 930 used in Seinfeld’s internet show sold well under estimates at Gooding last year. Good luck. Last edited by shlobeck; 01-31-2018 at 09:11 PM.. COnsider the "other cars in the auction" - the more Porsches the better as that means more Porsche Buyers...and all it takes is TWO of them to want your Car. Also - which serves the most booze for free - that seems to help inhibitions and machismo loosen the wallet as -ssholes try to show up their peers. That said - why not post here, Renn, eBay and others. No fees like the auctions and a huge audience. Agreed much too late for the houses at Amelia. Too often the overhead of placing a car in an auction house negates the best value of an average or above average car. Your objective at these auctions is to stimulate interest of non-Porsche buyers, with extremely low mileage, a unique color combo, or rarity. The 930 is surely not rare in the spectrum of these auctions so you better come with a very clean, well preserved example. The Petrol blue/cork interior is a huge advantage. With prices fluctuating it’s unpredictable on the worth at that particular place in time. Are you willing to deal with the contingencies if it doesn’t sell and you find yourself $2-3k into a car you still own? It’s kinda like a good hand of limit poker, the more people you have to call your nut-hand the more money you can potentially make. A unique colored cashmere ‘79 930 used in Seinfeld’s internet show sold well under estimates at Gooding last year. Good luck.